I discovered Jim's blog, "Just a Lil Blog," a few months ago and from the first post I read - I was hooked. Jim has made me laugh and cry, his voice is honest and poignant. 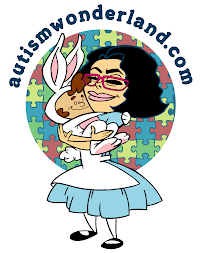 His blog header says it all: The true life adventures of a little girl with autism, and her struggles raising her two parents with only a big sister to help her. Lily sees “Rockin’ Santa” on the hearth the morning after we decorated the Family Room. She wanders over to pick him up, saying, “Santa Claus”, clearly. Maybe we’ve learned our lesson from all of Lily’s adventures with other animatronic decorations. She’ll be fascinated with him, no, obsessed with him, for a day or two before losing interest. I thumb the switch on and adjust the potentiometer dial to a higher volume. “Rockin’ Around the Christmas Tree,” starts to play. It’s been twelve months since I’ve heard it. It doesn’t make me cringe yet. It will. Santa begins to sway to the music, cuttin’ a rug to Brenda Lee’s musical stylings. Lily gets excited and carries Santa too far from the power strip. The chord pulls taut then the lead pops out from the back of Santa’s boot where it trails across the carpet to the plug-in and he goes silent, his Achilles heel pierced by an unseen arrow, or unpierced I suppose. Lily stumbles a bit at the unexpected release and looks around in slight confusion. “You have to stand still with Santa. Be gentle,” we admonish her, carrying Santa (and her) back to the hearth and plugging him back in. The music starts over. This time I do cringe a little. This process repeats itself a few times before the lesson sinks in and Lily contents herself with standing or sitting next to the power strip with Santa, or as far as he’ll reach without pulling from the socket, a trip wire of Christmas spirit waiting to snare the unwary (her big sister, Emma, most likely). 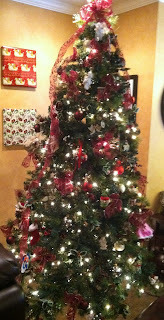 The Christmas tree is up and decorated. Burgundy velvet ribbons weave in and out of pine boughs. Limbs drip with sparkling glass and shining brass ornaments, reflecting and refracting the glint from hundreds of white lights. Lily investigates it periodically. Once she leans in very close. The ‘needles’ (it’s an artificial tree) are beaded with ‘ice’. She opens her mouth widely and says, “I bite tree”. I watch her from my chair, wondering where this is headed, but she leaves after a few minutes, the tree unbitten. This threat seems to have been more to see whether I’d let her bite the tree than for any gratification tree biting might have offered her. Later she stands next to the tree watching me intently, taking blind swipes at it without taking her eyes from mine, an attention getting device of some kind, though my attention is fixed firmly on her. “Be gentle with the tree, Lily,” I tell her, for the tenth time. She hits it this time. The bows sway slightly and a faint jingle of ornaments shifting and swaying can be heard. “If you hit the tree again, Lily, you’re going to have to sit in timeout.” She hits the tree again. She sits in timeout. She leaves the tree alone then, at least for a while. 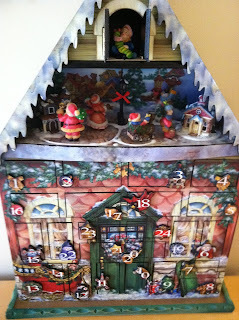 An advent calendar sits in the hallway. It’s a big one, not one of the paper cut-out kinds with the flaps. It is shaped like a house with 24 doors. Behind each numbered door is candy, or a tiny ornament. When the doors open “Santa Claus is coming to Town” chimes, and a shuttered window like a cuckoo clock door opens revealing a child in winter clothes opening a Christmas stocking full of presents. Below the door, a scene animates; little townsfolk skate in circles around a tiny town that lights. Lily ignores it, which is a blessing. Her sister, Emma, opens the doors daily for them both. Lily doesn’t really eat the candy behind the door, and the ornaments for Emma’s tiny tree are too fragile to be entrusted to her tender care, so really it’s just for Emma. I dread the day she decides it’s no longer beneath her notice. On the main floor a large posterboard cutout of Santa Claus’ head smiles benignly from the powder room door. It’s a remnant from some past Christmas party, and Emma loves it, so we keep it, tacking it to the powder room door. Lily walks past the door and pulls it off the tack. The tack clatters to the floor, skittering across the tile before scribing slow rocking quarter circles across the tile and coming to rest. I scramble to pick it up before she steps on it in her stocking feet. “Lily, be gentle with Santa. Don’t pull,” I tell her. I tack the fallen head back onto the powder room door and guide Lily back into the ‘safer’ environs of the Family Room. Santa sits ensconced in velvet. A human-sized elf stands to his right with a clipboard. We have a number so that we don’t have to wait in line for our turn. Lily is allowed to play at the mall playground or investigate the Christmas train while we kill time. All the children waiting to see Santa are like Lily. And all of the children waiting in line are different than Lily. But you know what I mean. When it is Lily’s turn the elf standing guard over Santa’s person hands us a form to fill out. Both of us are there so one of use rides herd over Lily while the other fills out the form. It occurs to me that if I were a single parent, I’d have to fill out the form at the same time as I was watching Lily. I shake my head that an event designed to minimize stress for autistic kids and their parents could triumph so magnificently overall but stumble at the finish line over such an obvious issue. I again thank god that I’m not a single parent and that my wife is always there to support me. When the paper work is filled out, Lily sits on Santa’s lap. She occupies his right knee, while Emma sits atop his left. She is calmer when Emma is with her. Nevertheless a stranger with a white beard is holding her on his lap. She suffers this curiously for 5 – 10 seconds. She doesn’t yank his beard, but seems to find brief fascination in the tuft of fur dangling from Santa’s hat. We furiously thumb shutter buttons and pray for quick focus on digital cameras. She squirms a bit and escapes to a safe distance to watch as Emma relays both of their Christmas wishes. Lily’s are guesses. She never really asks for anything except McDonald’s. Santa will definitely be getting her a gift card there, if he wants any cookies this year. When we visit our families’ houses there are lots of decorations everywhere. It’s beautiful, but dangerous for Lily. She wanders from “no” to “no”, generally wreaking havoc on everyone’s’ houses without really understanding what all the hub-bub is about. The family is gathered together. There are more people than usual in each house, more “nos”, more music and laughter and expectations. We try to keep her entertained and minimize the destruction and still visit with the family, but it’s stressful. Every holiday visit is stressful. 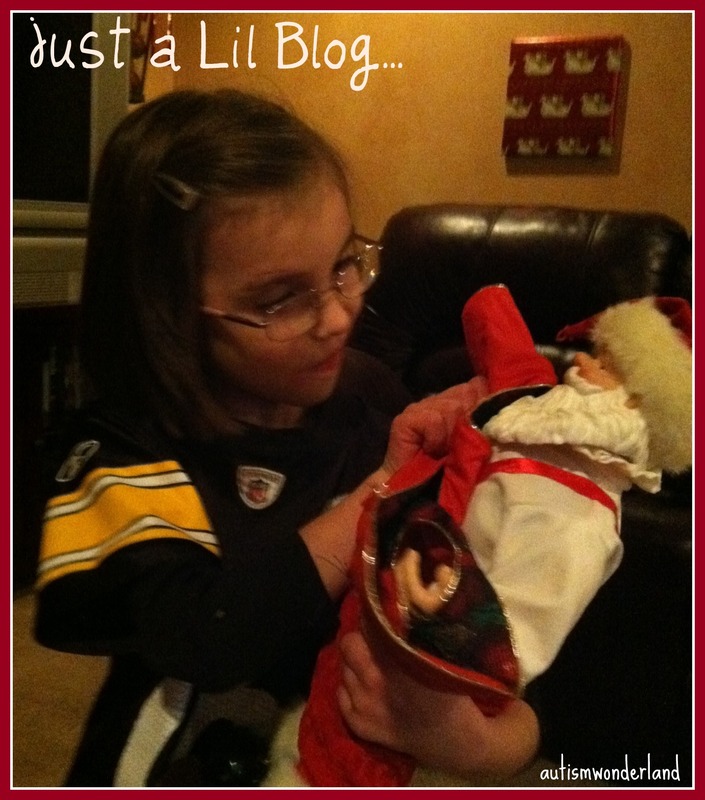 Lily knows who Santa is without really registering what he’s supposed to represent. Lily knows how to say “Merry Christmas” (when prompted) without really understanding what that represents either. We put the gifts in front of Lily on Christmas morning, and sometimes she rips the wrapping paper, and sometimes she ignores it completely. She doesn’t look forward to Christmas, or get excited Christmas Eve for the jolly fat man’s impending housebreaking. Christmas for Lily has all the stress it has for me, but none of the magical payoff. I’m doing my best to try to see the world from Lily’s point of view. I feel like I’ll be better equipped to help her if I try to see things the way she does. I feel like I’ll better understand what she needs and wants. Christmas is like magic to me. But Christmas is like magical holiday torture to Lily. Lily’s sister, Emma, loves it. We all want Lily to love it too. But she doesn’t. And that’s okay. We’ll still fight the good fight. We’ll still try to make it special for her without removing those things that also make it special for her sister. Some things we can’t (or won’t) change. The decorations will still go up. The music will still play. We’ll still visit family. And Santa will still be the jolly prowler, sneaking into our home when we sleep to distribute presents. Even once Emma “knows”, that probably won’t change. The biggest change and gift we can give Lily for Christmas is to adapt our expectations of what she’ll get out of the experience to something more ‘reasonable’ given what we know about what Lily tolerates/likes/loves. She still loves the music. She’ll get presents she’ll enjoy (probably). But Christmas is NOT magic for her. Maybe it will be someday, but for now it’s stress layered on top of stress. It’s noise and crowds and intriguing fragile ornaments and decorations that invite, no demand, inspection but that cannot be touched. Our expectations for Lily need to be filtered through Lily’s point of view. We need to understand that Lily will want to hear “Rockin’ Around the Christmas Tree” dozens and dozens of times. We need to understand and be patient with her when she investigates the tree, or pulls Santa off the door, or opens the advent calendar out of order, or breaks Christmas bulbs at her grandparents’ houses. Lily is a happy little girl. And it seems ironic that we’d take that happy little girl and make her miserable in an attempt to get her Christmas experience to line up with our expectations of what her Christmas experience should be. Lily will have a merry Christmas, though Christmas day might not be any merrier than any other day of the week; December may be no jollier than any other month of the year. But if we’re patient with her, and try to see things a little bit through her big brown eyes. Maybe it won’t have to be less merry, less jolly. And relaxing our own expectations might make our holidays a little happier too. It’s not reasonable to take a child whose entire life and comfort is bound so rigidly to structure and routine, insert ten times the number of restrictions and expectations for one month, and expect perfect compliance, or even anything approaching perfect compliance.